These bars from the new China Study Cookbook by LeAnne Campbell are rich, creamy, sweet, and satisfying - everything a dessert should be! -1. Crush graham crackers in food processor. In separate bowl, add walnuts, coconut, and peanut butter. Stir in crushed graham crackers. 2. Slowly add milk and mix. If mixture does not hold together, continue adding additional milk until all ingredients stick together. However, don’t make it too soft, and, if necessary, use your hands. 3. Spread mixture evenly into a 9 × 9 nonstick baking dish. 4. In a saucepan, melt chocolate chips together with rice or almond milk over medium heat. Stir until smooth. 5. Spread chocolate mixture on top of peanut butter mixture. Refrigerate for 1 hour or until hardened. Cut into squares and enjoy! Official companion to The China Study by T. Colin Campbell, PHD. With almost a million copies sold and hailed as one of the most important health and nutrition books of our times. The China Study reveaks that the traditional Western diet has led to the widespread growth of today's most prevalent issues from obesity to cancer. The China Study Cookbook takes these findings and gives you meals backed by The China Study science. Quick, flavorful meals based exclusively on a healthy, whole food, plant-based diet. Enjoy over 120 tasty recipes from Fabulous Sweet Potato Enchiladas and Pumpkin Pancakes to No-Bake Peanut Butter Bars, Cheese(Less) Cake. Chickpeas (aka garbonzo beans) are one of the most awesome legumes in the world! In Greece, where my family is from, chickpeas were a staple in everything from dips to desserts. The ancients praised them for curing kidney stones, regulating blood sugar, lowering cholesterol and other natural remedies. Chickpeas really shine when it comes to taste, recipe versatility and nutrition. These little gems feature a nut-like taste with a smooth, buttery texture. They are high in flavor, fiber, protein (15 grams per cup) and essential nutrients (such as iron, folate, magnesium (220 mg in one cup serving!)... and best of all, chickpeas are low in fat. such as organic brown rice or millet and you have a nutritious, plant-based complete protein meal with all nine essential amino acids. do wonders to support healthy blood sugar levels and reduce cravings for not-so-healthy sugary snacks. Every cook should have a pantry filled with chickpeas ~ dried, canned (for quick convenience), chickpea flour and chickpea miso. You can use them to make the classic hummus with sesame tahini for dips, wraps and delicious sandwiches, chickpea salads with garden fresh veggies, warming and nourishing stews with corn bread and healthy digestion supporting soups with chickpea miso. Chickpeas can even be roasted as a tasty, good-for-you snack! The ideal way to cook chickpeas is in a pressure cooker for maximum softness at the shortest cooking time. In the early morning, I sort through the dry chickpeas and discard any pebbles or mud pellets (that often can accompany dried beans) and then I wash them a couple times with fresh water. Then I cover the chickpeas with fresh spring water (about a couple of inches above beans) and soak for 9 - 10 hours right in my Silit pressure cooker. To cook the chickpeas, I pour out the soaking water and add fresh spring water covered about an inch from the top of the chickpeas. I add diced onions, garlic and a strip of kombu, a nutritious flavor and digestive enhancing sea vegetable, cover and bring to pressure. I reduce the pressure and simmer for one hour. I allow the pressure to come down naturally, remove lid and season with ¼ teaspoon of sea salt per dry cup of beans. I usually make enough cooked chickpeas to serve just as they are the first day served with a nourishing grain dish such as millet with carrots. Then I will make something new with them the next days lunch (hummus, chickpea salad...) or dinner. Blueberry muffins are, hands down, the all American favorite of muffins. This vegan version is oh, so yummy and oh, so healthy. Made with only whole grain flours and no refined sugar, these muffins are delicately sweet, showcasing the real star...the blueberries. Preheat oven to 350 degrees and line a standard muffin tin with papers or lightly oil and flour. Whisk together butter spread, applesauce, rice syrup, milk and vanilla until emulsified. In a separate bowl, whisk together flours, salt and baking powder. Fold in wet ingredients to create a smooth batter. Fold in zest and berries. Divide batter evenly among the muffin cups, making them each about 3/4 full. Bake until the centers of the muffins spring back to the touch, about 35 minutes. Cool on a wire rack. baking powder, cinnamon, lemon rind and natural sea salt. 1. 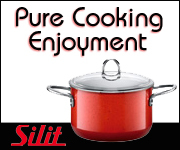 Lightly coat bottom of Silit ceramic fry pan with vegetable oil. mix into large mixing bowl. milk, oil and syrup to create foam. ingredients to form thick batter. more oil to fry pan as needed. 8. Serve hot with your favorite toppings. I created my Organic Chef Tom’s Good Morning Pancake and Waffle Mix making pancakes for 30+ years with our five children and seven grandchildren! We spent many Sunday mornings making these tasty, dairy-free pancakes for family and friends. When the children were young, we often poured the mix out into fun shapes. I hope that you enjoy making and eating them as much as we do.